Jarrell Miller says he would love to fight Anthony Joshua next year at Madison Square Garden and punch him in the face! Jarrell Miller has called for Anthony Joshua to defend his world titles against him in New York, if the unified champion decides to make his American debut in 2019. The Brooklyn man, nicknamed 'Big Baby', confronted Joshua on a previous visit to the city and both heavyweight rivals were attending Saul 'Canelo' Alvarez's win over Rocky Fielding at Madison Square Garden. Joshua has voiced his desire to face Deontay Wilder in an undisputed title clash at Wembley on April 13, but Miller believes he should receive a shot at the British star when he fights for the first time in the US. "I'm looking forward to seeing him again and face-off with him," said Miller. "It's all fun, it's not personal, only business. "AJ is a great champion, doing his thing outside and inside the ring, but sooner or later I'm going to punch him in the face. "Anybody that has the belt, that's how I feel. I feel like I can beat AJ any day, I know I can beat Deontay." Asked about an ideal venue for a Joshua fight, Miller added: "Madison Square Garden is the Mecca of boxing. I don't care what anybody says. If AJ wants to come to America, this is the place to do it, and I'm the man to punch him in the face. Joshua's promoter Eddie Hearn has been working with Miller in the States and admits he could be a few wins away from challenging the British star. "I do know that Anthony Joshua against Jarrell Miller at Madison Square Garden would be something very, very special," said Hearn. "AJ is over there. We're keeping it nice and clean tonight. 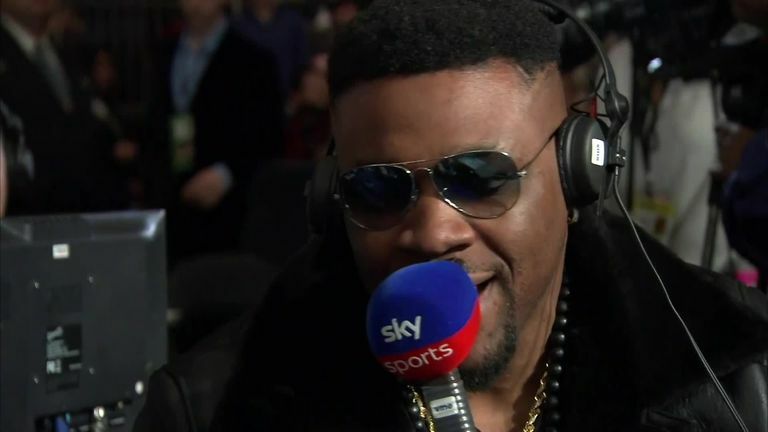 "Jarrell is doing great, he's going to come over to Britain I believe for the Dillian Whyte fight, and he's doing great things.